Last week Tyler Foxworthy, Chief Scientist at DemandJump, talked about his lectures at SIAM’s upcoming annual convention. This week Tyler dives into how DemandJump is building dynamic graphs, inter-domain connectivity, and attacking the connectivity question differently than everyone else. Analyzing domain connectivity initially became popular because of Google’s PageRank algorithm. A BBC iWonder article explains that the Google PageRank algorithm ranks result based on links to the site, content relevance and quality, and geography. However, due to its static nature there are vast opportunities to boost your page’s rank via spam methods. Google is actively honing its algorithm to filter out inaccurately ranked URLs. DemandJump’s ranking algorithm looks at the flow of traffic from one site to the next using links to assign rank to sites. Looking at how traffic flows several layers out allows us to find patterns that show dynamic relationships between websites. 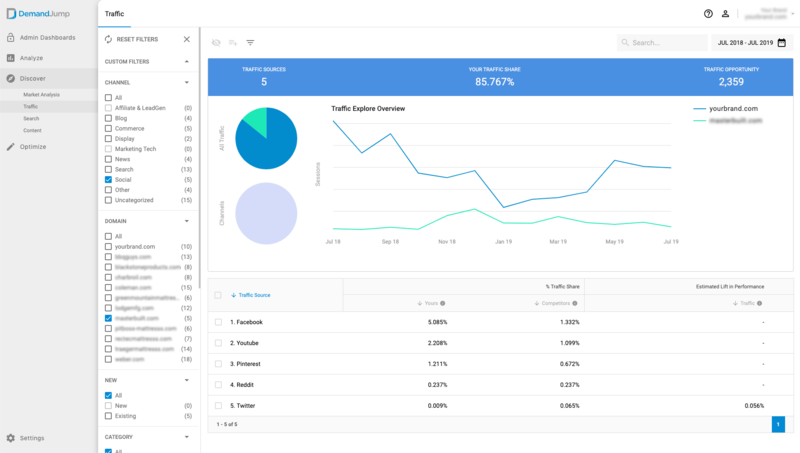 The DemandJump platform allows users to monitor dynamic traffic and it builds an ecosystem around the user and their competitors. Looking at traffic flows throughout this ecosystem allows the DemandJump platform to make very robust recommendations by evaluating and ranking potential referral opportunities. Tyler goes on to compare this to the difference in structural neuroscience and functional neuroscience. The mathematics behind the platform are inspired by the dynamic graphs of the brain, helping him and his team to accurately unwind the dynamic referral ecosystems.